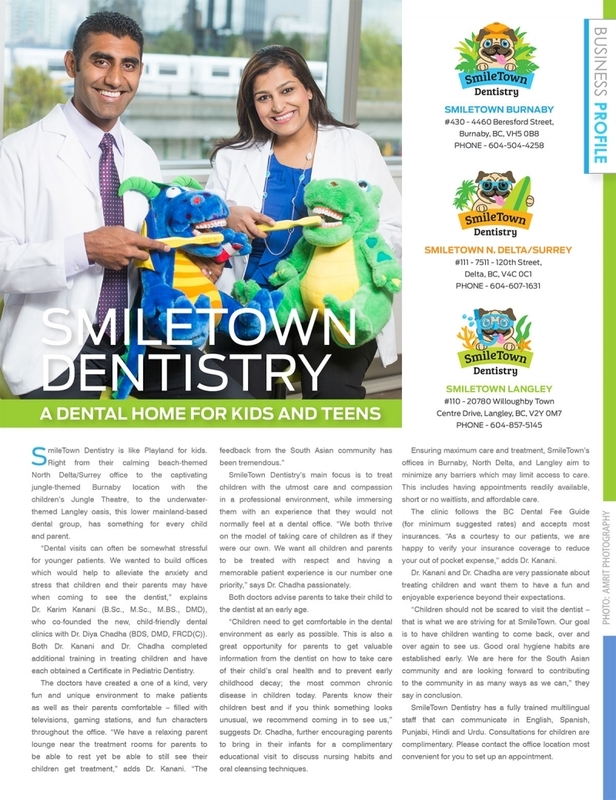 Darpan Magazine recently featured Smile Town Dentistry, and our dentists, Dr. Kanani and Dr. Chadha talked about the importance of positive early dental experiences for children, and their focus on serving the South Asian community in Surrey and North Delta. Darpan Magazine is a pioneer in South Asian media, and has been a leader in the Canadian market since 2004. Darpan provides readers with diverse, lifestyle-based features as well as thought-provoking, meaningful and engaging editorial pieces. SmileTown Dentistry was honoured with a feature in this superb publication recently. Our dentists, Dr. Karim Kanani and Dr. Diya Chadha, were given an opportunity to talk about the vision and mission behind our practice. They both emphasized our focus on providing child-friendly dental care, and on making positive contributions to Burnaby's South Asian community. Read more about what Dr. Chadha and Dr. Kanani had to say about SmileTown Dentistry, here.